What even is this weather here this week? I can’t even cope with how cold it’s gotten, especially in my flat where now I don’t actually even bother to take my coat off when I get in. I was literally FREEZING taking these, and I had to take my coat off. The park looks pretty sorry for itself too, in fact the whole of London just looks grey, wet and miserable. Get me out of here. Planning on winning the lottery tonight so I can do just that, just need to buy a ticket first. So, instead of moaning about the weather, let’s talk about my new watch from Daniel Wellington. First of all it looks like it could be vintage (as does this top actually) so that’s always a plus from me, and it comes in rose gold, another plus. Since getting it, I did wish I’d gone for the lighter tan strap but I really liked the ‘crocodile’ pattern of this one first. But it’s pretty and lightweight and goes with everything so I’m really pleased really. See, look how cute it is! 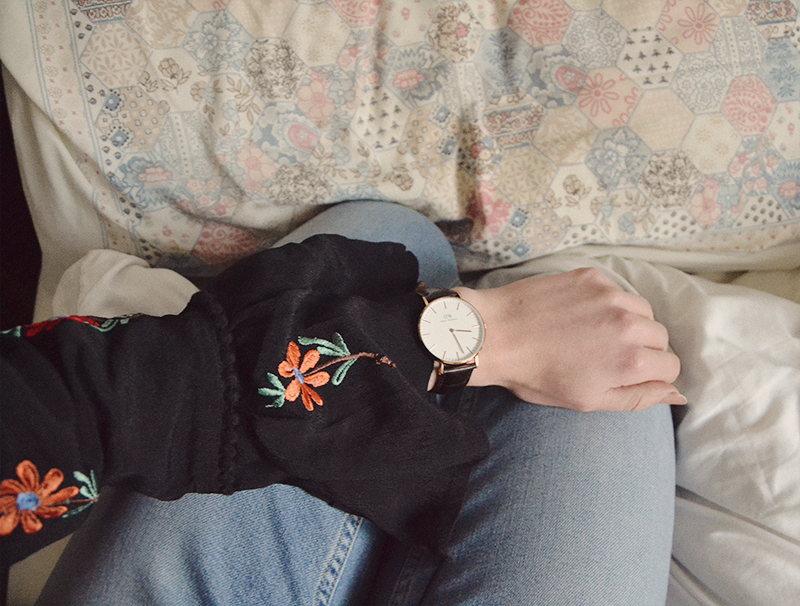 And if you want a Daniel Wellington watch you can get one for 15% off using the code: sara_waiste which is valid until January 15th. I love the look, especially the jeans ! What a beautiful watch! I love the whole look actually; the sawn off hems of those jeans just pull everything together. And your coat! Dreamy.